Tom’s got his car back, and he’s talking to Ed when we see Johnjo, Tom and Ed’s illegeal patient, rushed into theatre with Ric and Diane. It’s obvious that he’s been operated on before, by a surgeon who clearly knew what he was doing, except that the incision looks like it has been done with a kitchen knife, and his injuries have been packed with dishclothes. Both Diane and Ric are intrigued…. Sandy’s having a bad day. She’s having to deal with a stroppy elderly patient, and she confesses to Danny that she spent the night on geriatrics to get more money, and is back on Darwin in the morning – with no sleep! She asks Danny not to tell Chrissie and that Chrissie will never notice, but Sandy’s all over the place and is not impressed to hear about Chrissie’s agency work. She says that if they weren’t short staffed, she’d send Sandy home immediately. Johnjo has deteriorated, and Ed’s rushed to Keller Theatre. The problems are too extensive for Ed’s surgical knowledge, and TCG is paged. Ric’s constantly guessing about the identity of the mystery surgeon, but Tom and Ed stay calm and successfully stabilise Johnjo, or “John Smith” as he’s been brought in as. Ed then goes to lunch with Chrissie and is worried that she’s told Owen about his father being in prison. He gets seriously wound up, and Owen interrupts them. Lisa, having already caught sight of Terry and Kath kissing in the car, talks to her father. She says that he was too quick to “get her in the sack” and refuses to listen to what he has to say, she just sees it as him not giving her mother a chance. Danny, however, is happy that his mother has a chance of happiness after 25 years, but Lisa isn’t as keen. Ed says that Johnjo desperately needs another operation, but Tom’s convinced his condition would mean his lungs would collapse. Tom tells Sandy to put him on an infusion, and Sandy, looking rather confused, gets on with it. 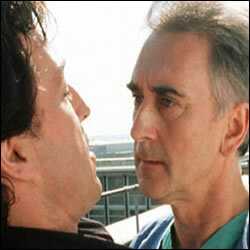 However, later after he arrests, Tom tells Sandy off for not following his procedures as apparently she’s missed one. In theatre, both consultants and registrars are fighting to save Johnjo’s life. He dies, despite Ed’s requests to put him on bypass. Chrissie, amazingly siding with Sandy, tells mr. Campbell Gore that his notes were unreadable and it wasn’t Sandy’s fault. Tom tells Sandy that he realises this, and he apologises. Tom meets Craig and his brother and delivers the news of Johnjo’s death to Craig. Craig’s convinced that Tom let him die and threatens to kill Marty. Tom manages to convince him that the medical situation meant that Johnjo would have died anyway. Tom gives his brother money and tells him that he never wants to see him again. He then meets Ed and says that he was aware that Sandy performed a double shift, but it didn’t matter anymore. – Val Snow on maternity gives birth to a baby boy Matthew with her partner Rob by her side. However, it becomes obvious that the baby belongs to a pupil, 17 year old Peter. Val gets rid of Peter by saying that Matthew has a genetic disorder from Rob, but it turns out that she’s lying, the baby is Peter’s. Rob knows the truth, but appears to not care. – Minny Hunt has cancer and is snappy towards Sandy. Her grandson has a thing for Sandy. – Johnjo, brought in after TCG and Ed’s illegeal surgery, dies on the operating table. Ed: (cycling in to work) Alright, Sandy? Ed: Did Sandy Harper misread the ephedrine notes? Only I was looking at them..
Tom: Ed, the girl’s exhausted. She’s been up all night doing agency shift on geriatrics. Tom: Well, I admit, she’s done us both a favour. Johnjo would hardly have survived another crisis. But there’s nothing to suggest anything out of order, I understand. Is there?